MINSK, 22 June (BelTA) – The dialogue between the state and the church in Belarus will continue developing in harmony, Belarus' Premier Andrei Kobyakov said at the reception in honor of Patriarch Kirill of Moscow and All Russia on 21 June, BelTA learnt from the Belarusian Exarchate. “Your visit is highly appreciated in Belarus. I am confident that the dialogue between the state and the church in Belarus will continue developing in harmony,” the press service of the exarchate cited the Prime Minister as saying. Attending the reception was Metropolitan Filaret, the Honorary Patriarchal Exarch of All Belarus, Metropolitan of Minsk and Zaslavl Pavel, Patriarchal Exarch of All Belarus, Deputy Prime Minister Natalia Kochanova, Commissioner on Religious and Ethnic Affairs of the Republic of Belarus Leonid Gulyako, representatives of the Belarusian Orthodox Church, Apostolic Nuncio to Belarus Claudio Gugerotti, Metropolitan of Minsk and Mogilev Archbishop Tadeusz Kondrusiewicz and others. 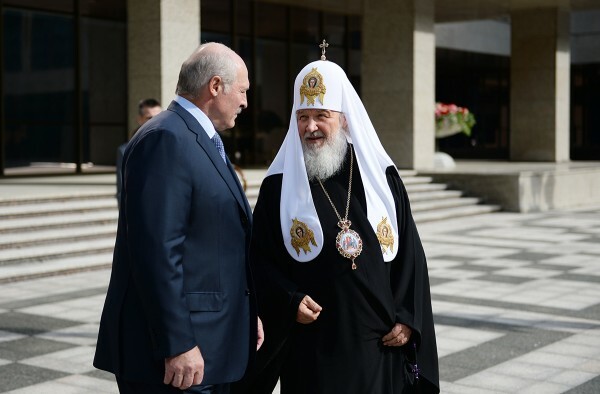 Patriarch Kirill of Moscow and All Russia paid a visit to Belarus on 20-22 June.